6-stage Filter Cartridge by CRYSTAL QUEST, a standard 10"x2.5" replacement filter cartridge that is commonly utilized in different combo-filtration systems. 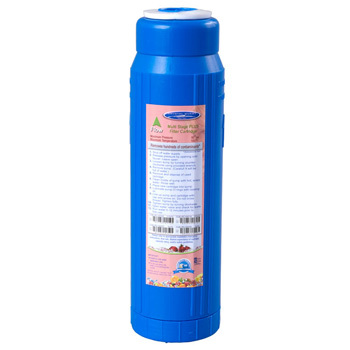 It is the main workhorse cartridge for CRYSTAL QUEST's filter systems that uses the 10"x2.5" filter cartridge housing. It is best used for low-flow applications such as counter top and under sink setups. 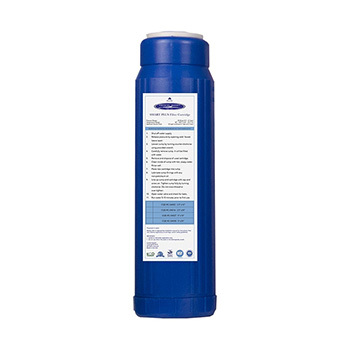 Inside this filter cartridge is a combined bed of advanced filtration media that targets hundreds of contaminants from your drinking water. The water treatment technology applied by both Coconut Shell Carbon or Granulated Activated Carbon (GAC) and KDF Media ensures that water comes to you at the cleanest and purest state. Combined media for wider range of contaminants. Fits in most Crystal Quest Filtration applications. Equipped with Coconut Shell Carbon(GAC) and advance KDF media. Variant specification for different filtration capacity. * The main difference between the 3 cartridges is the amount of KDF / Eagle Redox media (which is a mix of copper and zinc) used. Less expensive cartridge will have more charcoal and less Redox, and more expensive cartridges will have more Redox. I use this mounted before the water line goes to the frig and filters it again. I get water from the frig for everything cooking drinking etc.. It tastes great but after a year I recommend replacing because the housing tends to get stagnent and needs a good cleaning. Great product. Lasted only about 4-6 weeks in a home with 2 adults. When it was working, before the water flow came to a trickle the water was very good quality. Would not purchase again as it does not last. Expected at least 3 months from it. We have a lot of iron in our water. Comment Reply: Joel, thanks for your comment. Lots of iron should clog these filters, as it tries to remove iron and has a limited capacity for it. 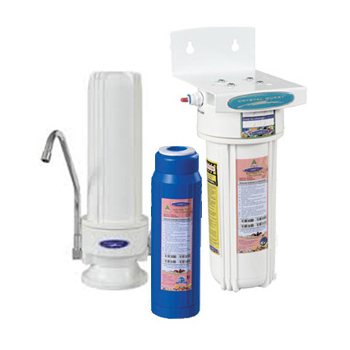 When filtering lots of iron with a countertop or under sink system, we recommend filtering through an iron removal cartridge first, which means you need to have a standard 10"x2.5" dual or triple filter system, or purchase a separate 10 inch inline housing for iron filter. The 6-stage Filter Cartridge works amazing! My mother and I both use this product. It filters our water so good, it taste better than when you buy it bottled at the store. Both my house and my mother’s house are very old. The water piping we have is quite old, and was giving off a metallic taste. After using or water filtered through the cartridge, its taste heavenly! A+++product!